2012-02-27 First worldwide family litigation filed litigation Critical https://patents.darts-ip.com/?family=28041836&utm_source=google_patent&utm_medium=platform_link&utm_campaign=public_patent_search&patent=US20030233330(A1) "Global patent litigation dataset” by Darts-ip is licensed under a Creative Commons Attribution 4.0 International License. A system and method for creating a rights expression for association with an item for use in a system for controlling use of the item in accordance with the rights expression, including specifying rights expression information indicating a manner of use of an item, the rights expression information including at least one element, the element having a variable and corresponding value for the variable; and performing an encoding process, including determining an identifier associated with a template corresponding to the rights expression information, extracting from the rights expression information the value for the variable corresponding to the element, and encoding a license adapted to be enforced on a device based on the variable and the identifier, the license including an identification of the template and the value for the variable. The present invention claims benefit of priority under 35 U.S.C. §119(e) to commonly assigned, co-pending, U.S. Provisional Patent Application Serial No. 60/363,932 of Raley et al., entitled “USE OF RIGHTS EXPRESSIONS IN APPLICATIONS WITH PERFORMANCE CONSTRAINTS,” filed on Mar. 14, 2002, the entire disclosure of which is hereby incorporated by reference herein. encoding a license adapted to be enforced on a device based on said variable and said identifier, said license including an identification of said template and said value for said variable. interpreting said encoded license on said device based on said identification of said template and said value for said variable. 4. 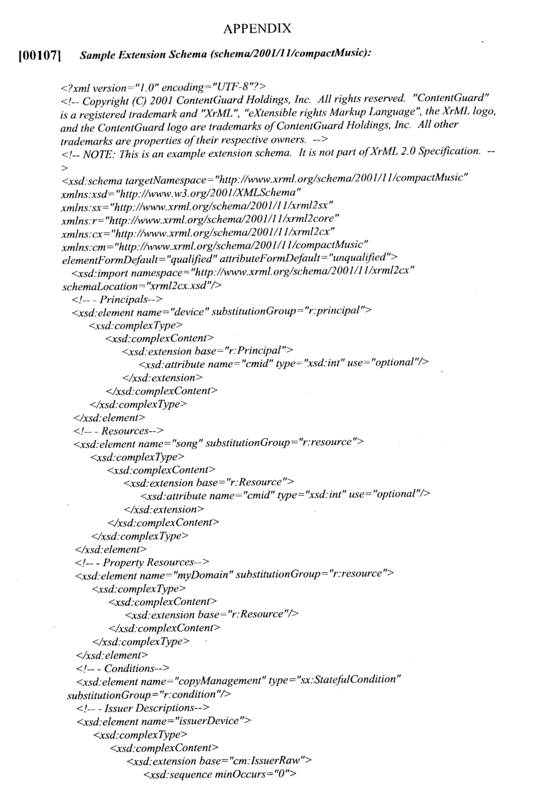 The method as recited in claim 1, wherein said template comprises a data structure. 5. The method as recited in claim 1, wherein said template is associated with a company. 6. The method as recited in claim 1, wherein said template is associated with a type of device. 7. The method as recited in claim 1, wherein said device comprises a handheld device. 8. The method as recited in claim 1, wherein said device comprises a resource constrained device. encoding a sub-license that is a subset of said encoded license and is adapted to be enforced on another device based on said encoded license and a template associated with said another device. verifying said digital signature before enforcing said encoded license on said device. 12. The method as recited in claim 9, wherein said template associated with said another device is retrieved from a template server. 13. The method as recited in claim 1, wherein said device comprises a rendering device. 14. The method as recited in claim 1, wherein said rights expression information is grammar-based. 15. The method as recited in claim 1, wherein said template associated with said another device is retrieved from a template server. 16. The method as recited in claim 1, wherein at least one of said rights expression information, and said template comprises a glyph. means for encoding a license adapted to be enforced on a device based on said variable and said identifier, said license including an identification of said template and said value for said variable. 18. The system as recited in claim 17, wherein said rights expression information includes conditions that must be satisfied in order to exercise a manner of use of said item on said device. means for interpreting said encoded license on said device based on said identification of said template and said value for said variable. 20. The system as recited in claim 17, wherein said template comprises a data structure. 21. The system as recited in claim 17, wherein said template is associated with a company. 22. The system as recited in claim 17, wherein said template is associated with a type of device. 23. The system as recited in claim 17, wherein said device comprises a handheld device. 24. The system as recited in claim 17, wherein said device comprises a resource constrained device. means for encoding a sub-license that is a subset of said encoded license and is adapted to be enforced on another device based on said encoded license and a template associated with said another device. means for verifying said digital signature before enforcing said encoded license on said device. 28. The system as recited in claim 25, wherein said template associated with said another device is retrieved from a template server. 29. 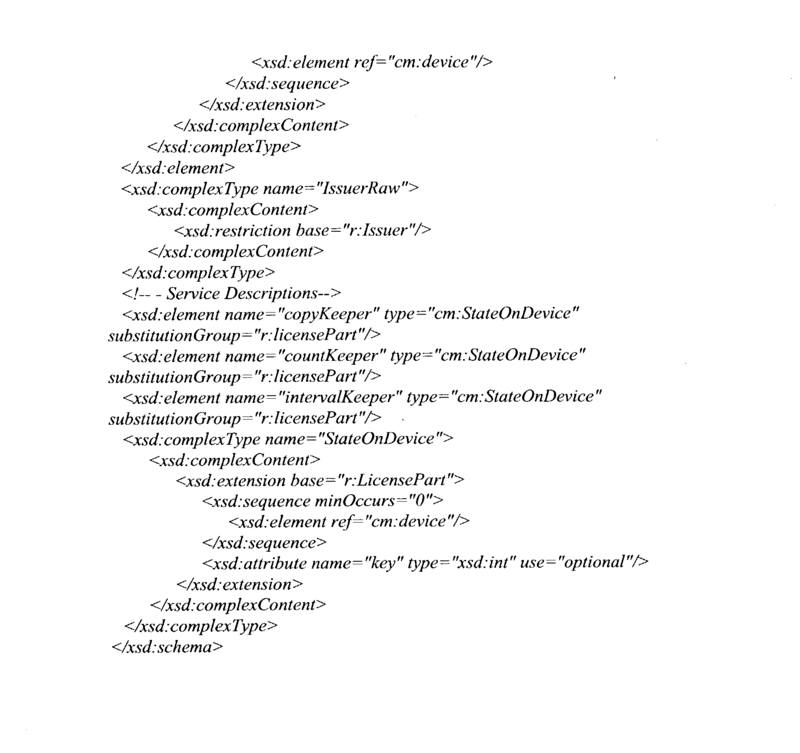 The system as recited in claim 17, wherein said device comprises a rendering device. 30. The system as recited in claim 17, wherein said rights expression information is grammar-based. 31. The system as recited in claim 17, wherein said template associated with said another device is retrieved from a template server. 32. The system as recited in claim 17, wherein at least one of said rights expression information, and said template comprises a glyph. 33. The system as recited in claim 15, wherein said means for specifying, said means for performing, said means for extracting and said means for encoding comprise devices of a computer system. 34. The system as recited in claim 49, wherein said means for specifying, said means for performing, said means for extracting and said means for encoding comprise computer readable instructions recorded on a medium.